Having made it through Christmas and New Years, Melbourne is sleepy in January and at times too hot to do anything other than veg out. Many opt for the beach, camping or taking off in some other way. Throughout summer Melbourne Night Markets are great places to hang out, feel part of life, listen to music, get something to eat and find some original wares. They are hip and generally a bit pricy, but the food and drink is oh so good! And its usually organic and made with love. 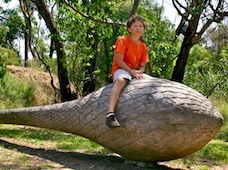 Nevertheless, it is a growing Melbourne thing, with quirky wares, world food, bars, world bands and kids running free! This is where the weird and wonderful come out at night! Let's be straight. Melbourne is not really your typical Australian beach location. 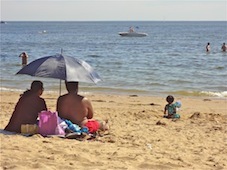 But during January, many Melburnians and visitors hit the beaches. There are the Bayside beaches, which the further you get from the city become serene, crisp and beautiful. Ideal for children, stand-up paddle boarding on calm days, sailing and kitboarding on others. 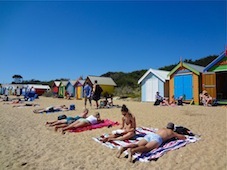 The Brightong Beach huts are a Melbourne icon, but for cleaner and less crowded beaches, it's better to head further south. Ocean beaches and wild surf are not really that far and make for a great day trip - or exteneded holiday. From Phillip Island to Wilson's Prom and Gipsland, to the Bellarine Peninsula and Great Ocean Road. Lots of oppurtunity to surf, bodyboard or splash in the waves. But it's not a tropical destination and wetsuits are a really good idea if you like to hang out in the water for a while, especially if you're used to warmer waters. It features live music and feature films playing on a huge movie screen on top of the St Kilda Beach pavilion. There is tasty food, great views and sunsets, indie bands and singer-songwriters and full-length feature films, including cult movies, classics and new releases. This is a BYO outdoor cinema experience. Enter the Botanical Gardens from the Domain Road, South Yarra, and you'll find a large sloping lawn with a huge blow-up movie screen showing all sorts of new releases and favourites. Bring your picnic rug, food and drink. It is a beautiful setting overlooking the gardens and distant city. This is the sophisticated arty and urban summer experience. The Rooftop Cinema is located on the roof of the Curtain house, 252 Swanston St, in the heart of Melbourne. Reflecting the creative Melbourne, it showcases the best of arthouse, classic and recent release films. Summer heat and tennis are upon us in January. If you are lucky you may spot one of the tennis greats in town. It starts with the Kooyong Classic, January 11-14, a qualifying tournament for the Australian Open. The Australian Open is one of the major sporting events in Melbourne. It is held from January 16-29, with live broadcasts onto the big screen on Federation Square. 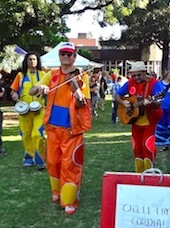 Australia Day is celebrated with many community events around Melbourne municipalities celebrating what it means to be Australian. There are fireworks along the Yarra at nightfall. For something different and a bit of Australian bush culture you can witness the Australia Day Woodchop in the Alexandra Gardens, where some of the finest axemen in Victoria show their skills on the standing block, in underhand and cross-cut sawing competitions. Brighton hosts the Great Australia Day Swim, a 1.4 km and 5 km Open Water Swim around the Middle Brighton pier and marina to the beach for all sorts of ages and includes family fun activities. Celebrations go on for the whole week and include street stalls, firecrackers and countless traditional and contemporary Chinese cultural activities, Chinese opera, karaoke competition, numerous stalls of culinary delights, arts and crafts, Chinese chess competitions, lion dances, dragon parades, calligraphy and childrens events. 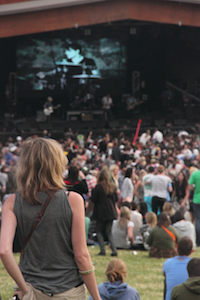 These are some highlights of What's on in Melbourne in January. The spirit of Melbourne comes to life in its many community events, bars and live performances, which are too numerous to be listed here.